Hi . Purchased Billion capture+ after considering smartron srt , k8 note and honor 6x. If you compare srt and BC+ you will find some features are better in srt. After reading mails in forum and having BC+ in my hand, I understand some issues are still pending. After using 3 redmi phones I thought must move to other brand. Response on Flipkart is mixed. So smartron had to take customers along . But in a country like India which supplies programmers to the world in millions, solving problems is not big deal if company is responsive. a) small tint . In my phone screen slight yellowish. b) lack of some soft buttons. Like screenshot. Congratulations for the new product called Billion Capture plus. It's gonna rock very soon in India. As I became owner of Billion Capture plus 4GB/64GB model. I would like to share my experience. I want to confirm did any one notice while locking phone with power button our wallpaper changing its colour for a blink of our eyes. And some times while opening camera showing"camera hasbeen stopped". And mostly the menu screen showing simple white background with apps ordered alphabetically. I hope GUI can be improved effectively. I've heard that imges taken from capture plus have a reddish tinge. Do you also feel same? @gardes.india you have bought billion plus also? Can you give a comparison between the two devices? Can anyone help me who had capture+, is the camera is really good ??? @anujdhyani First of all battery performance is great, physical keys of capture plus are more tactile than srt phone, physical look and feel is good, @Kirang camera quality is decent but needs improvement, sometimes I'm getting greenish photos when I uses flash, software is more stable in capture plus (let's hope that we will also get that in coming update), needs camera improvement otherwise phone is very good. @RohitRathi - is there any official forum available for Billion Capture+? I bought the phone and using it from last 5 Days...it is awesome phone...need some bug fixes...and customization in ROM. Hope we will get ROM update soon and regularly. 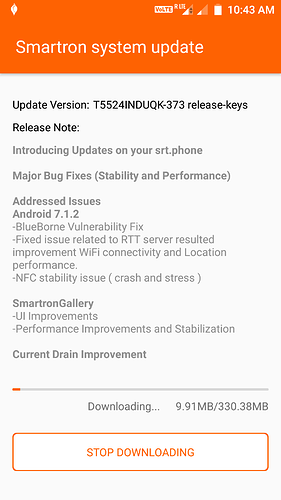 @RohitRathi @Abhishek_TV Great but what about SRT phone camera update ? ?